The name, 'Tuli Block', has an interesting origin. 'Tuli' is a river in Zimbabwe which has given its name to this region. The 'Block' is an allusion to a large piece of land, some 10km to 20km wide and more than 350km from north to south. 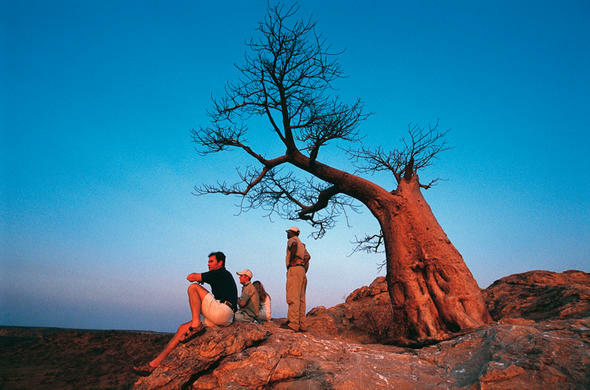 Tuli Block, historically known as the Tuli enclave offers a quick and easy access to a wilderness area with guaranteed sightings of game.It contains an abundance of wildlife, a profusion of birds and fascinating topography. The great Limpopo river together with the rugged and unsoiled nature of its countryside, gives the northern Tuli Block its special character. Mashatu and Tuli Safari Lodge are two commercial tourist centres situated in the Northern Tuli Block.From comfortable game viewing vehicles, you will typically spot an abundance of wildlife including elephant, kudu, impala, wildebeest, giraffe, lion, zebra and leopard. The most popular area within the block is the North-East Tuli Game Reserve situated between the Limpopo, Motlouse and Shashe rivers.The reserve integrates the Mashatu Game Reserve, Tuli Nature Reserve and other smaller game reserves. Tuli is also an area with numerous archaeological and historical sites, which endows us with evidence of early communities. Pottery shards, beads, smelting relics and granaries can be seen at a few of these sites. Apart from a portion of land in Ghanzi, around Gaborone and Lobatse, Tuli Block remains one of the few areas where freehold land in Botswana is available. On the two daily game drives in Mashatu Game Reserve, be on the lookout for some of the 350 recorded bird species, waterbuck, eland, elephant, cheetah, lion - some black maned - and leopard. In addition, caracal, aardwolf, hyena and jackal can be seen at night.Birdlife is plentiful in the Tuli block. The bird enthusiast will get to see a remarkably fascinating spectacle of some of the 350 recorded species, which include shrikes, the boulder chat, the short-toed rock thrush, raptors, woodpeckers and even ostriches. The aquatic species are especially interesting and include the cormorants and the beautiful pygmy kingfisher. On the banks of the Limpopo River, Tuli Safari Lodge affords attractive chalets accommodating from two to eight guests. All the chalets have en suite bathrooms. There is a choice of rooms or suites and all chalets are fully serviced. From Johannesburg, you can fly a private charter from Lanseria Airport (north of Johannesburg) to Tuli airstrip. Contact Mashatu Game Reserve to arrange flights. Situated along Botswana's southeastern border with South Africa, on the Limpopo River, is this varied landscape of lush woodlands and rocky hills.